Author(s): Elise A. Mahe, Gilles Salbert. UMR6290 CNRS, Universite Rennes 1, Campus de Beaulieu, B13, Avenue du General Leclerc, 35042 Rennes Cedex, France. DNA methylation in unique genomic regions like enhancers and promoters contributes to cell identity by silencing gene expression. Hence, establishment of cell-specific repertoires of active genes during cell differentiation or in response to extracellular signals may require erasure of this epigenetic mark. 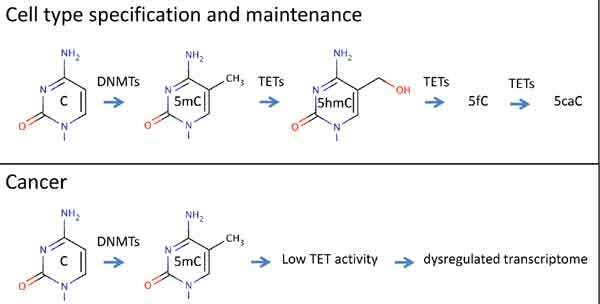 By their ability to hydroxylate the methyl group of 5-methylcytosine (5mC), Teneleven translocation (TET) proteins are part of the cellular machinery erasing DNA methylation through molecular mechanisms involving iterative oxidation of 5mC, base excision and repair. Here we review recent discoveries on TET functions and their role in regulating the genome activity to establish and maintain cell identity. We further describe how the TET-mediated processes are affected in cancer cells and propose possible strategies for the correction of these cancer-associated defects. Keywords: 5-hydroxymethylcytosine, 5hmC, cancer, DNA methylation, TET. Affiliation:UMR6290 CNRS, Universite Rennes 1, Campus de Beaulieu, B13, Avenue du General Leclerc, 35042 Rennes Cedex, France. Keywords:5-hydroxymethylcytosine, 5hmC, cancer, DNA methylation, TET. Abstract:DNA methylation in unique genomic regions like enhancers and promoters contributes to cell identity by silencing gene expression. Hence, establishment of cell-specific repertoires of active genes during cell differentiation or in response to extracellular signals may require erasure of this epigenetic mark. By their ability to hydroxylate the methyl group of 5-methylcytosine (5mC), Teneleven translocation (TET) proteins are part of the cellular machinery erasing DNA methylation through molecular mechanisms involving iterative oxidation of 5mC, base excision and repair. Here we review recent discoveries on TET functions and their role in regulating the genome activity to establish and maintain cell identity. We further describe how the TET-mediated processes are affected in cancer cells and propose possible strategies for the correction of these cancer-associated defects.